Former UFC two-division champion Conor McGregor may be on another legal battle right now, but that does not mean he will stop from living his best life. Just last week, “The Notorious” suffered another setback as he was arrested and charged on multiple counts, following a heated confrontation with a fan at Miami Beach. He allegedly smashed and stole the fan’s mobile device after attempting to take a photo of him. McGregor walked out of the Miami-Dade County jail after posting a bail of $12,500, but a hearing to the case is scheduled on April 10. Days after this misfortune, the popular UFC star is back again doing usual McGregor things. On Saturday night, he served as a special guest at the Boston Bruins and Columbus Blue Jackets NHL game. Before the match, he graced Boston’s locker room and went on to deliver a fiery pre-game speech to the Bruins, and it was lit! Conor McGregor had a busy day during the St. Patrick’s Day last weekend. After visiting several US states such as Maryland, Illinois, Pennsylvania, and Texas to promote his Proper 12 whiskey, the former featherweight and lightweight kingpin graced the ceremonial dropping of the puck at NHL, which featured a match between the Bruins and the Blue Jackets on that day. The mammoth TD Garden crowd welcomed ‘The Notorious’ with loud cheers after he was introduced and entered the arena with his famous entrance song, “Foggy Dew”/“Hypnotize” remix, playing in the background. 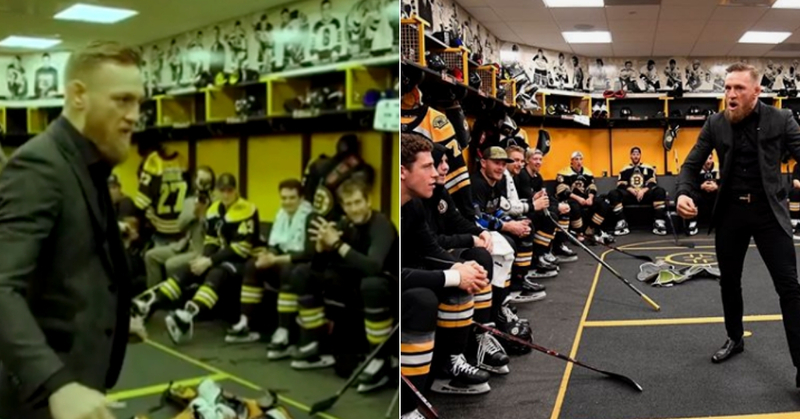 Prior to the pre-game ceremony, McGregor went to the Bruins’ locker room and gave the team some words of encouragement. McGregor’s pre-game speech might have worked for the Bruins as they survived the Blue Jackets in a thrilling 2-1 overtime contest. Last week, McGregor had another run-in with the law as he was captured by the Miami Beach police after being charged with strong-armed robbery, a second-degree felony, and criminal mischief, a third-degree felony. He is currently serving a six-month suspension for his role in the infamous UFC 229 post-fight brawl and will not return to actions until April.